Twine: <<autolink>>, a macro to automatically make links. This macro, when surrounding a span of text, will search through the text, finds words that are also names of passages in the story, and converts them to internal links. * Since Twine passage names are case-sensitive, this search is also case-sensitive. * It currently only matches single ASCII words (letters and numbers) and hyphens contained within, but currently not apostrophe-containing words. * <<autolink>>The most popular pets are dogs and cats<<endautolink>> - Assuming the passage "dogs" exists, that becomes "dogs". Not too sure of the name - might change it later. This code is largely based on some original macros posted to the Google Group by, er, somebody. These take a YouTube video ID and plays the audio of that video invisibly in the background of your Twine game. The player will require Flash installed, of course. * The volume slider is removed, on the basis that most authors will probably not have much call for it. Also, it required jQuery and jQuery UI, which not only inflated the footprint of the script, but may have interfered with other jQuery-using Twine scripts. * It supports multiple sound tracks per story, and lets you play them simultaneous with each other if you so wish. * A few more macros are provided, roughly in line with my HTML5 audio macros: <<unloopbgm>> and <<pausebgm>>. * There should be more informative error messages for specific error codes. 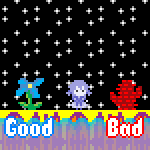 The macro names themselves are similar, but I made the following changes: <<playbgm>> now plays the audio once, and <<loopbgm>> causes it to constantly loop. Otherwise, they function identically. Note: For browser security reasons, local HTML files are prohibited from accessing network files through a Flash embed. So, you have to test these macros by running the game from a web server. *<<playbgm iHBWZn9re0U 32>> plays the YouTube video starting from 32 seconds in. *<<playbgm iHBWZn9re0U>> plays the YouTube video from the beginning, or resumes it if it was paused. *<<stopbgm iHBWZn9re0U>> stops the sound track. *<<loopbgm iHBWZn9re0U>> makes the sound track constantly loop (although it may not quite be seamless). *<<unloopbgm iHBWZn9re0U>> stops it from looping. *<<pausebgm iHBWZn9re0U>> pauses the sound track. *<<stopbgm iHBWZn9re0U>> stops playback and resets its position to the start. * <<insert>>, <<replace>>, <<continue>> — triggered by clicking their contents. * <<timedreplace>>, <<timedinsert>>, <<timedremove>>, <<timedcontinue>>, <<timedcycle>> — triggered by time. * <<hoverreplace>>, <<hoverremove>> — triggered by the mouse touching their contents, only temporarily. * <<mousereplace>>, <<mouseremove>>, <<mousecontinue>>, <<mousecycle>> — triggered by the mouse touching their contents, permanently. * <<once>>, <<later>> — triggered by visiting the passage a certain number of times in the game session. * <<insertion>>, <<revision>>, <<removal>>, <<cycle>> — triggered by a separate "triggering macro". * <<revise>>, <<revert>>, <<randomise>> — hyperlinks. * <<mouserevise>>, <<hoverrevise>> — sections that the mouse can touch. * <<replacewith>>, used to separate sections in <<timedreplace>>, has been replaced with <<becomes>>. These function just like they do within <<revision>> macros - <<becomes>> replaces the previous section with the next section, and <<gains>> merely appends the next section. 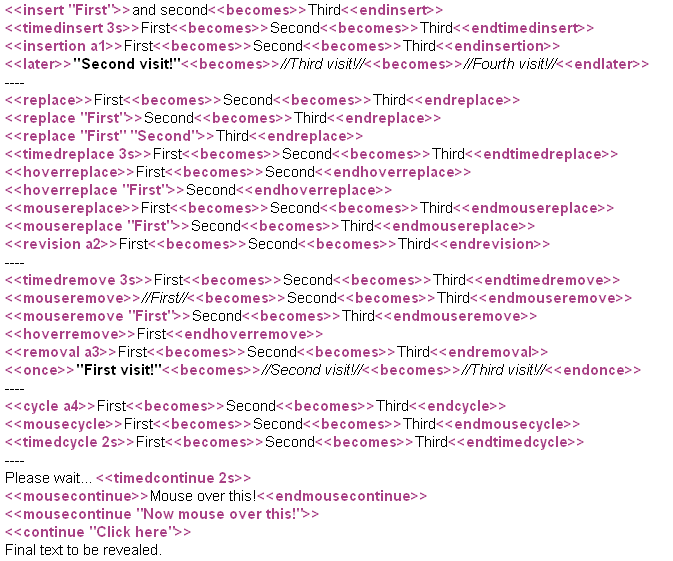 The final section must be between the opening tag and the <<endreplace>> macro tag, though. For most of these, the shorthand strings behave as if the <<becomes>> macro separates them. The exception to this is the "insert" named macros, wherein the strings will behave as if the <<gains>> macro separates them. * <<later>> is the antonym of <<once>> - it displays its contained text on the second and subsequent visits. * <<mousecycle>> creates a section of text that cycles between different versions whenever the mouse touches it. It's similar to <<cyclinglink>> in some respects, though you can't yet easily bind a variable to change when it changes. * <<timedcycle>> constantly rotates through its sections without stopping. It is similar to <<timedloop>> and may well replace it in future. In any of these examples, <<becomes>> can be substituted with <<gains>>. Don't use the attached file. It's out of date. This set of macros is a mouse-driven counterpart to <<replace>> and are essentially a simpler form of <<hoverrevise>>. They cause a span of passage text to change into a different span when the mouse moves over it. It comes in two main varieties: <<mousereplace>> replaces the span outright when the mouse touches it, whereas <<hoverreplace>> simply displays the alternative span while the mouse is hovering over it, and will change back when it leaves. <<mousecontinue>> functions like the <<continue>> macro, causing a single enclosing span to disappear when the mouse touches it, and revealing all subsequent passage text. <<mouseremove>> creates text that simply disappears when the mouse touches it. Separate both versions of the span using <<becomes>>. <<hoverreplace>>You see here a clock.<<becomes>>It's 8:09PM.<<endhoverreplace>> causes the text "You see here a clock" to become "It's 8:09PM." when the mouse hovers over it, and go back when the mouse leaves. <<mousereplace>>A [[bird]]!<<becomes>>It flew away.<<endmousereplace>> causes the text to become "It flew away." when the mouse touches it. <<mousecontinue>>Move here to begin.<<endmousecontinue>> hides all further passage text until the mouse touches "Move here to begin. ", whereupon those words vanish and the text is revealed. <<mouseremove>>Don't touch me!<<endmouseremove>> causes "Don't touch me!" to vanish when the mouse touches it. If you use <<gains>> instead, then the second version is appended to the first version. <<hoverreplace>>[[End game|Quit]]<<gains>> Are you sure? ?<<endhoverreplace>> adds the words "Are you sure??" after the link while you hover over it. <<mousereplace>>You see a barrel. <<gains>>It is empty.<<endmousereplace>> adds the words "It is empty." when your mouse touches the words. 16-6-2013: Updated regarding Combined Replace Macro Set. The <<hoverrevise>> macro is an extension of the <<revision>> / <<revise>> macros. It lets you make a span of passage text briefly appear or disappear whenever you mouseover another span of text in the same passage. Just install the latest version of <<revision>> (1.1.0 or later). It's included already. If you aren't using any normal <<revise>> macros, you could omit "[class*=hover]" to make every <<revision>> span have this transition. These are just a few of the possibilities allowed by this macro. This wraps the contained text in a <span> with the class "hoverrevise" as well as "hoverrevise_" suffixed with the identifier you use (for instance, "hoverrevise_boo" for <<hoverrevise boo>>"). The <<revision>> macro is a more powerful variation of the <<replace>> macro. It lets you alter a span of passage text by clicking a link from anywhere in the passage. Install my <<Replace>> Macro Set to use these macros. You see here <<revision tome>>a closed book.<<becomes>>an open book.<<endrevision>> Each section of text separated by <<becomes>> is a different "version" of the text. The name "tome" in the macro is an identifier. You can use any single word you want as an identifier. This creates a link reading "Open the book" that changes any "tome" revision in the passage into the next version - in this case, changing "a closed book" into "an open book". The above code will set $button to true when you click the "Push it." link. In this case, the link "Chew book" will change "a closed book" into "a chewed book", then "paper scraps". When it reaches the end, the link vanishes. The <<revert>> macro functions to reverse the effects of the <<revise>> macro. The <<revert>> macro's link won't be displayed if it's at the first revision, just as the <<revise>> macro won't be visible if it's at the last revision. The <<revise>> and <<revert>> macros have a number of additional options similar to the <<cyclinglink>> macro. You can supply additional link text strings after the first, and it will change to the next string after you click it. If the second parameter begins with the "$" sigil, then it will interpret it as a variable to be altered by clicking the link. When the player clicks the link, the variable will be changed to match the text of the link. If the last parameter is the word "end", then it will disable the link at the parameter before last, leaving just the text. If the last parameter is the word "out", then it will vanish altogether once it's reached the final string. Click here to read about <<hoverrevise>>. Just as the <<replace>> macro has a variation, <<insert>>, so too does <<becomes>>. The vase contains:<<revision vase>>Two roses<<gains>>, an orchid<<gains>>, a pencil<<gains>>, a straw<<endrevision>>. <<revise vase "Put something in the vase">>. When you click "Put something in the vase", the text changes from "Two roses" to "Two roses, an orchid", then to "Two roses, an orchid, a pencil" and so forth. This changes from "One" to "Two", "Two and a half", and finally "Three!". Normally, when a <<revision>> macro reaches the end of its revisions, its links disappear. If you change "revision" to "cycle", then you can keep clicking the link to return to the first revision. You see here <<cycle pet>>a dog<<becomes>>a cat<<endcycle>>. This will change "a dog" to "a cat" and vice-versa, with the link never expiring. Two other variations exist, which are roughly analogous to <<timedinsert>> and <<timedremove>>. For <<insertion>>, the first version "1 grain" is initially invisible. Clicking a <<revise>> link will make it visible. Then, it functions as normal. For <<removal>>, the <<revise>> link will remain when you get to "1 seed". Clicking it a final time will remove the text altogether. Each version inside a <<revision>> macro is a <span> classed with "revision-span" as well as the kind of version they are ("becomes", "gains"). When they appear, they are given the class "revision-span-in" and their display is set to "inline". When they disappear, they gain the class "revision-span-out" and, after 1 second, their display is set to "none". All of these are inside a container <span> classed with the name of the macro ("insertion", "removal", "cycle", "revision") and the name of the identifier ("book" or whatever the author set it to be). <<revision>> macros were being called twice on passage load. <<revision>> macros were still taking effect while they were animated being removed by other macros. Multiple <<revision>> macros with the same ID weren't all being revised at the same time. 26-4-2013: Added extra options to <<revise>>. 20-4-2013: Added <<hoverrevise>> and support for <<randomise>>.